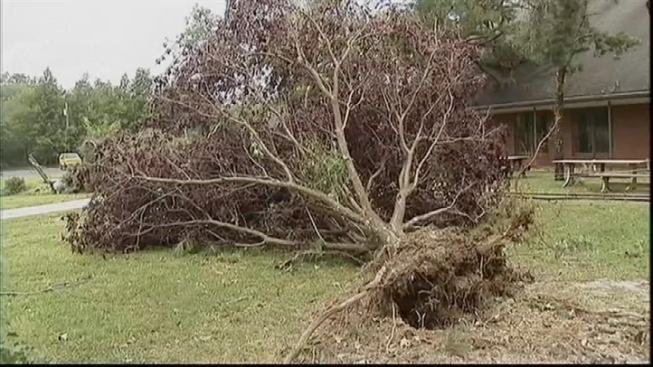 The National Weather Service says a tornado touched down in southern Ocean County, N.J., amid a series of powerful storms that battered the Jersey Shore as far north as Bergen County Tuesday morning. The EF-0 tornado flooded roads, knocked down trees and damaged homes in the Manahawkin section of Stafford Township when it ripped through the region at around 10:30 a.m.
"I could not believe just how fast everything went down," said Gale Vanwaalwijk, who witnessed the destruction in Manahawkin. "All I heard was whistling, snaps of trees, lightning going through, heavy heavy rains and it was very, very scary." The tornado touched down near the intersection of Route 9 and Oak Avenue, then lifted near the intersection of Hilliard Boulevard and Beach Avenue, according to the National Weather Service. In the tornado's path of destruction, the Lighthouse Christian Academy suffered a damaged roof and three classrooms were water-logged. A tree also fell on a garage. An EF-0 tornado is characterized by maximum wind speeds of 75 to 85 mph, a path width of up to 50 to 100 yards and a path length of up to 2 miles. Heavy winds and rain were reported along the Jersey Coast as far north as Bergen County. In Long Branch in Monmouth County, firefighters rescued a mother and her 7-month-old son as her station become stranded on a flooded road. Dozens of emergency vehicles and crews were spotted across the tri-state area as torrential, wind-swept rains produced floods and caused power outages, primarily in southern New Jersey, where at least 2 inches of rain fell in a relatively short time and 65 mph wind gusts felled dozens of trees.